Just a little north of Bay View Resort is the newest Pizza Oven in town. Guests have so many options when dining here in Myrtle Beach, but we want to share the growing dining options for you to choose. 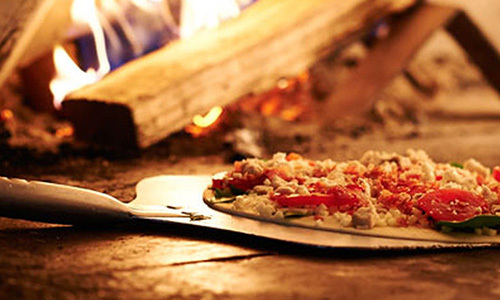 Started with a single shop in Charlotte, North Carolina, 20 years ago, Brixx Wood Fired Pizza has since put down roots at more than 30 locations throughout the Southeast – and the latest spot to host the regional chain’s wood-fired brick ovens is located just over 4 miles from Bay View Resort, at 8006 North Kings Highway. Brixx serves pizzas created with house-made dough, then topped with fresh veggies, meats, and cheese made right on-site with the finest Wisconsin dairy milk. To give its signature creations their distinctive, wood-fired taste, Brixx then cooks its pizzas in a brick oven, serving to enhance the natural flavors of all of the high-quality ingredients. The Brixx menu – which includes vegan and vegetarian offerings, as well as options with a whole-wheat crust and items that are gluten-free to accommodate any guests with dietary restrictions – features a number of signature “Classics” with creative (and often gourmet-territory) topping combinations. For example, the Korean Pepper Steak gets a Korean barbecue base, then is topped with shaved roasted beef, roasted peppers & onions, sesame seeds, cracked black pepper, fresh cilantro and mozzarella. Another unique example, the Spicy Shrimp, gets a Sriracha base before being topped with spicy shrimp, sun-dried tomatoes, roasted red peppers, fresh basil, mozzarella and goat cheese. Of course, more-traditional options are available for those seeking a less-adventurous meal, such as the Americo with pepperoni, mushrooms and mozzarella on a tomato-sauce base, and the Bronx Bomber with Italian sausage, prosciutto, gorgonzola and mozzarella on a tomato-sauce base. The Veggin’ Out section of the menu offers meatless masterpieces such as the Pear & Gorgonzola pizza with sliced Asian pears, mozzarella, gorgonzola, walnuts & caramelized onions on an olive oil base, and the Wood-Roasted Vegetable pizza with wild mushrooms, broccoli, onions, peppers, fresh oregano and mozzarella on a base of tomato sauce. For guests who might not be in the mood for pizza, Brixx also offers a lineup of sandwiches made on focaccia bread that’s fresh-baked daily. Options include the Italian Beef with shaved roast beef, roasted peppers, caramelized onions, house-made stout mustard & gorgonzola, all with warm au jus for dipping, as well as the Roasted Chicken Sub with hand-pulled, oven-roasted chicken, pecan-smoked bacon, melted Fontina cheese, tomato, arugula and aioli. Pasta dishes, appetizers, salads and desserts round out the wide range of menu offerings – and guests can wash it all down with nearly 25 craft-beer options on tap and a wide variety of wine and cocktail options available. Check out the full Brixx menu at brixxpizza.com – and be sure to bring your appetite next time you visit the Grand Strand! After grabbing your fill of slices and suds, head back to your room at Bay View Resort to enjoy your comfortable accommodations and amazing amenities. Book your Grand Strand vacation at Bay View Resort today, and get ready to enjoy some of the best that the Carolina coast has to offer.